Home > Good News > Cleaning up the oceans? The alarming extent of plastic pollution in the oceans of the world has been getting a lot of attention lately. Seabirds, fish, even whales killed by mistaking plastic for food; stomachs full of plastic bags, drinking straws and plastic utensils; the “Pacific Gyre” now a floating garbage patch bigger than Texas. 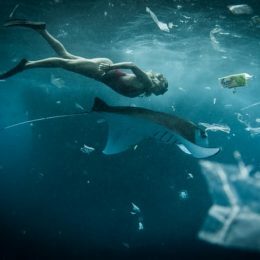 Daunting as the scale of global plastic pollution is, nations of the world are now committing to doing something about it. The European Commission is planning to ban 10 plastic items that make up 70% of marine litter. The EC estimates that it could cost businesses $3.5 billion per year, but save consumers $7.6 billion per year, while saving more than $25 billion in environmental cleanup costs. The EC is not alone. Last week, India announced a commitment to eliminate all single-use plastics by 2022. And this week, numerous major companies have joined the effort, pledging to eliminate single-use plastics like drinking straws, stirrers, utensils, lids and bags. The health of our oceans is threatened by more than just plastic. As the recent film “Blue” vividly shows, half of all marine life has disappeared in the last fifty years, due to overexploitation by humans. More than two billion humans depend primarily on seafood for their dietary protein. And marine algae are the “lungs of the earth”, producing more than half of the world’s oxygen. Water is life, whether we are speaking of lakes, rivers, aquifers, or the mother of us all, the world’s great oceans. Though the sheer scale of our collective task is daunting, it gives me hope to see national governments listening to the findings from environmental scientists, and crafting rational and responsible policies to steer our industrial world back toward sanity. Although the biosphere seems like a big place, we have shown humans perfectly capable of turning the air, land and oceans into a garbage dump. It’s high time that we roll up our sleeves and turn it around. If that seems impossible, just look at some of the impossible things that turned out not to be so hard!